With most of the snow melting away and the water in the lakes and pools coming to life, it is obvious that spring has passionately blossomed bringing in the freshness of life on the Earth again. It is the time when along with us our furry kids want to sip into the pleasure of spring and enjoy it to the fullest. And, to help them savor the amazing moments of this season, you need to work on this with the help of pet products. Bring in the best pet products and help your furry child to join the spring game. But, along with that bliss, there comes some dangers that we need to be aware off to ensure our pets’ safety. 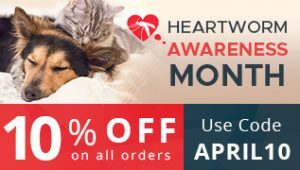 So, let us concentrate on the top five pet products to add into your pet supplies list that allow us and our pet to best cherish the season of flowers. Along with colors of joy and time to fun, spring also brings in a bundle of parasite problems for your furry pals. Those nasty pests sprawl out feeling the warm climate. It is the time when those nasty bugs arise and march towards the pet world to attack and quench their winter hunger. In order to stop them and send them back to the dark world, pet parents have to be well equipped with effective flea and tick control treatments. Some of the highly efficient products are Frontline Plus, Nexgard, Bravecto, Advantix and Advocate. Start treating your four-legged companions before the outburst of flea infestation as this will save your pet from itching and other skin problems and you from hefty vet bills. Spring means spending time under sun and sweating. Some breeds really get hot with their sweat glands working hard making them smell bad as well as smeared with sweat and dirt. A good pet shampoo is the perfect grooming partner of this season. There are numerous dog and cat shampoos available in the market that help remove dirt and leave pets smelling refreshing. To keep them sweat free and odor free regularly shampoo them. A shampoo followed by the conditioner invariably enhances skin and coat sheen and keep them fresh all day long. With flowers, green leaves, fresh air and running water all around, pets surely love to be there in the open and enjoy the season of spring to the fullest. Bring them fetch game toys or balls to play with under the tantalizing sun. These pet toys will not only make them happy but also help them exercise and boost their metabolism which must have been dormant during the colder months. Spring and water are connected to each other heavenly. Going on beach, swimming and water games are all synonymous when spring flows. Your furry pals would like to be there in the water and enjoy the season. 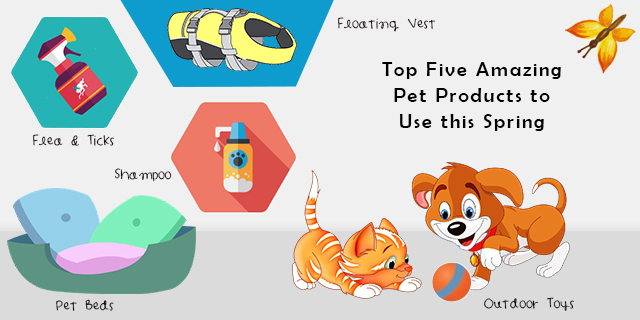 For their safety and in case if your pooch does not know swimming, floating vest is the best choice to have it for your dog. Warmer evenings during spring signal to the year’s first barbeques or drinks in the backyard or porch. To help your pooch enjoy the pleasurable setting along with you, get an outdoor dog bed. These wonderful beds are water resistant that helps resist wine spills and evening dew. They provide a great relaxing experience to enjoy under the spring stars. What is your take for the pet products during this spring? We would be happy to listen from you.